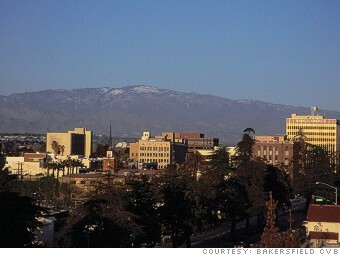 Located in the southern edge of California's San Joaquin Valley, Bakersfield is hemmed in on three sides by mountains making it a perfect place for pollution to linger and collect. "Light prevailing winds push air south and the farther south you go, the worse the air," said Seyed Sadredin of the San Joaquin Valley Air Pollution Control District. The area is also a major oil producing region, which introduces diesel soot, from well pumps, and chemical fumes into the air. Still, the area has made great strides in recent years. Overall, harmful emissions are down 80% over the past 20 years, according to Sadredin. Future improvement should come from recent Environmental Protection Agency programs that offer cash incentives to replace dirty diesel engines in trucks, tractors and buses. Jared Blumenfeld, the EPA's regional administrator, said local farmers have replaced many of their old tractors, as well as diesel-fueled water pumps with electrical ones.